ANKARA — The State of Qatar is the leading Arab country that exerts efforts for the settlement of regional disputes and the country is keen on effectively participating in all issues and challenges that confront the Gulf region. There are brotherly and historic ties between Qatari and Turkish people and, moreover, significant progress has been achieved in recent years with regard to relations between Turkey and Qatar. Qatar officially gained independence in 1971 and the establishment of diplomatic relations between Turkey and Qatar dates back to the 1970s. In the 1980s, Turkey and Qatar began to sign bilateral agreements and the relationship gained momentum in the years that followed. The ambassador said that "in particular, the bilateral relations gained further momentum in the 2000s and I sincerely would like to express that after 2011, the bilateral relations reached a level of harmonization and coordination thanks to the wisdom of the two countries' leaderships." On future relations the ambassador said, "There is no doubt that Turkey is a leading country in the region and as Qatar we expect that Turkey's role in the region will increase further in the coming years." Qatar attaches importance to Turkey's role in the region and the two countries' cooperation in international organizations such as the U.N. and the Organization of the Islamic Conference (OIC) has increased in recent years. High-level visits between the two countries have intensified and further developed their bilateral relations. Emir of the State of Qatar Sheikh Tamim bin Hamad bin Khalifa Al Thani visited Turkey twice in the last 12 months and Prime Minister Recep Tayyip Erdoğan visited Qatar last December. Moreover, Turkey's ministers of foreign affairs, economy and finance also paid visits to Qatar in recent weeks. The ambassador said the two countries shared a similar point of view and acted together during the Arab Spring. Ankara and Doha have pursued similar policies regarding international matters, particularly regarding the conflicts in Syria, Lebanon, and Iraq, and they followed joint conciliation efforts for the settlement of regional disputes. The positive role played by Qatar and Turkey in the recent reconciliation agreement between Palestinian political parties Fatah and Hamas can be seen as the latest example of cooperation between the two countries in terms of international relations. "Qatar and Turkey look at regional problems from the same perspective and this allows further development in bilateral relations. The main aim of our foreign policy is to ensure peace and stability in the region. 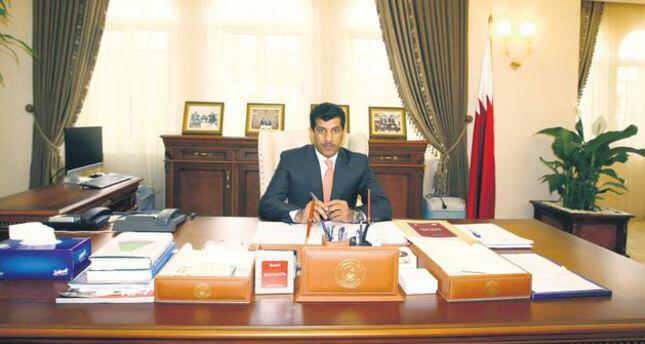 Ensuring peace and welfare of the people is the main desire of Qatar," Ambassador Al Shafi noted. In line with the development of bilateral relations, the two countries' economic relationship is also on the rise. "The growth in bilateral relations has resulted in an increase in the volume of trade between Qatar and Turkey. Total trade volume between our counties was only $26 million 10 years ago. This figure reached $1.3 billion at the end of 2013," Ambassador Al Shafi remarked. However, he underlined that the current level of economic relations and investment between Turkey and Qatar is not in sync with the almost perfect political relationship between them, adding that Qatar expects further developments in the countries' economic relations. "We see Turkey as a very efficient country in terms of investment. There are many opportunities for Qatari investors in the energy, transportation, tourism and real estate sectors," the ambassador said and added that Qatar expects more convenience for Qatari investors from Turkish officials. Assisting in furthering the relationship between the two countries, the Turkish-Qatari Business Council was formed in 2006 in order to develop and enhance bilateral economic cooperation. In line with this, the fifth Turkey-Qatar Joint Economic Commission meeting was held in Ankara in February. Turkish exports to Qatar mainly consist of iron-steel products. Electrical machinery and equipment, motor vehicles and parts, home textile products, furniture and food are among other export items. Turkey mainly imports natural gas, plastics and plastic products, and chemical derivatives from Qatar. Turkish investments in Qatar are generally focused in the construction sector and consultancy services. The total value of projects undertaken by more than 60 Turkish companies is approximately $13.5 billion. Furthermore, last week Turkish STFA Group and Yapı Merkezi won a tender for the Qatar Doha Metro Project worth $4.4 billion - the highest valued tender a Turkish contractor ever won abroad. Additionally, Qatar will host the 2022 World Cup and Turkey aims to get Turkish companies involved in new projects in the country. One of Turkey's priorities is to attract foreign investment and capital from Qatar. Qatar is considering investing in Turkey's power sector and discussions continue for a nearly $12 billion investment. In addition, a pipeline project to transfer natural gas from Qatar to Turkey is regarded favorably by the Qatari government. In order to complete the legal framework of bilateral commercial and economic relations, Turkey and Qatar have signed a number of agreements, including the Agreement on Enhancing Economic and Technical Cooperation, the Bilateral Investment Promotion and Protection Agreement and the Double Taxation Prevention Agreement. Thanks to these agreements, the two countries have strengthened relations and expanded cooperation in different fields. After the signing of the Military Training Cooperation Agreement, Qatar's coast guard decided to purchase 17 high-speed boats from Turkey. Furthermore, in March representatives from 25 prominent Turkish firms, including Aselsan, Havelsan, Roketsan, Turkish Aerospace Industries, the Scientific and Technological Research Council of Turkey, attended the Doha International Maritime Defense Exhibition. The bilateral relationship is also flourishing in the areas of culture and tourism. "There are more than 7,000 Turkish citizens already living in Qatar and the Turkish community in Qatar is already contributing to our society and economy," Al Shafi remarked. The number of Qataris who visit Turkey too increased significantly by 110 percent in 2013. Qatar has the highest per capita gross domestic product in the world and petroleum is the cornerstone of its economy. However, the country aims to reduce its economy's dependence on natural resources and the Qatar National Vision 2030 is part of a plan to transform Qatar into an advanced country by 2030. "In accordance with our 2030 goals, we aim for a strong economy that will be able to survive without depending on natural sources," the ambassador concluded.